Rent Brady's Bloomin' Barn Garden & Event Center | Corporate Events | Wedding Locations, Event Spaces and Party Venues. 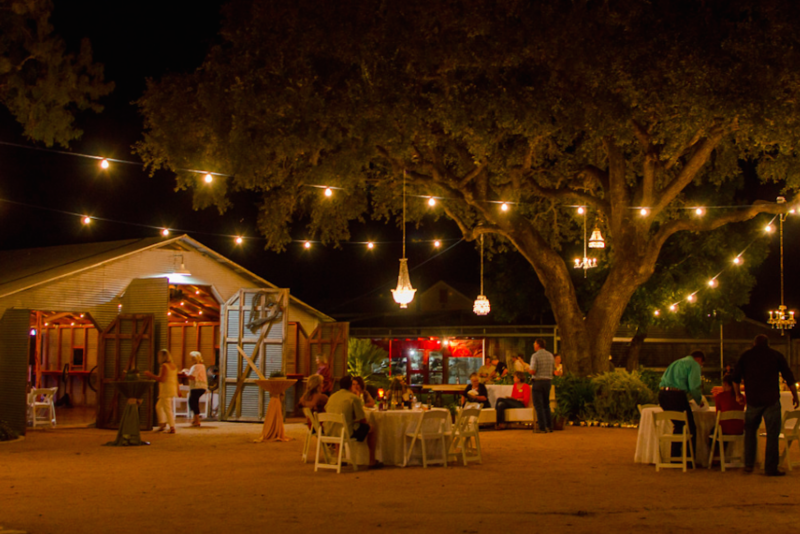 Brady’s Bloomin Barn is a one-of-a-kind setting, located on one of historic Rio Medina’s first garden lots surrounded by the existing homesteads, barns, and smokehouses. Located within the 7,200 square foot Main Building, the Red Room is a multifaceted space with its many features including a large custom kitchen, large island, stained concrete floors, and seating for 100+ guests. The Red Room is embellished with period antiques and decorated with influences of elegance and country charm. Naturally aged wood of the Rustic Barn beautifully accents the stained concrete floors, sparkling lights contouring throughout the soaring rafters, and illuminated custom vintage wagon wheel chandelier. This setting complements any event from a seated dinner to a charming dance hall. The rustic barn is located adjacent to the Courtyard. The Bar at Brady’s is truly a unique experience within its self, fashioned after a rustic South Texas sportsman’s theme. With its many majestic mounts lining the walls of this room. Many historical accents have been included in the design, such as the tin roof put together from the tin off of the Krueger Dairy to the piano. The Bar at Brady’s is one of the best local watering holes, as well as, garden and event venue. The perfect place to pick up a glass of wine or a nice cold beer. The AC in our Bar is always running providing you with a cool escape from the HOT Texas Sun! Come have a beer with Brady and talk about your next big event and take a look at all the different options that will be available for you to choose from. Located in one of Rio Medina’s most historic buildings, this beautifully renovated home is ideal for your wedding or event. You and your bridesmaids will love taking advantage of this charming country home which can serve as the dressing area for your bridal party. The home was established in 1905 as one of the Haby Settlement’s first garden homes.